If you have information about a crime or other suspicious activity that is occurring on SIU Campus and it is not an emergency, please call (618) 453-3771. You can report information about a crime through Carbondale Crime Stoppers. 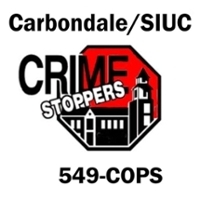 Carbondale Crime Stoppers is a community program that involves the public, media, Carbondale Police Department and the SIU Police Department in the fight against crime. It provides a unique way for information to flow from citizens to the police without having to give your name, address, or telephone number. Additionally, Carbondale Crime Stoppers pays cash rewards of up to $1,000 for information that leads to the arrest of an offender. To provide information through Carbondale Crime Stoppers call 549-COPS. It is monitored 24 hours a day, seven days a week, by members of the Carbondale and SIU Police Departments. More information about Carbondale Crime Stoppers can be found here.